First let me state that I cannot get enough of black and white movies. It isn’t possible. Of course color had to muscle in and change everything eventually, but well before that was the seismic shift that was the invention of the talkie. The title character in Fritz Lang (Heino Ferch) was already a powerful figure in silent cinema — Metropolis would have been enough to cement the reputation of any director / screenwriter — but as 1931 rolled around it was time for him to make the leap and add sound to his next masterpiece, the classic that would be known as M.
There’s just one problem: he doesn’t have a script, or much inspiration for one. His wife, Thea von Harbou (Johanna Gastdorf) is also his co-writer and she has some ideas for a movie about extortion, but their partnership is already crumbling in more ways than one. Lang habitually leaves her behind in favor of nocturnal adventures to doubtful parts of town, but no outlet can get him past the frustration. Then he catches sight of a fateful newspaper headline and sets off on a very different kind of adventure. A serial killer, discovered to be a man called Peter Kürten (Samuel Finzi), is targeting children and women in Dusseldorf, and the city is in an uproar. Sensing his inspiration at hand, Fritz unhesitatingly goes there, strange as it seems for anyone to treat a major criminal investigation like a tourist attraction. But he has a history with the police detective in charge, Ernst Gennat (Thomas Thieme), who seems quite happy to see the filmmaker, letting him become an integral part of the investigation. Suddenly the inspiration is gloriously there, with Lang hardly able to write fast enough. But as he walks in the killer’s footsteps, sometimes literally, it gets harder to tell how much of what he experiences is real and how much is part of his vivid, drug-fueled imagination. Lang also befriends a witness named Anna Cohn (Lisa Friederich) whose friend was killed. Anna is one of the few to have seen the Dusseldorf Monster and lived, and her testimony may be vital. But for Fritz, she’s also important in another way, as a double for his dead first wife, Lisa, and the past mixes dangerously with the present. The film is visually stunning, done in black and white (with the occasional unsettling touch of red), which allows for the seamless addition of footage from M as well as evoking the era. The historical Lang’s work was a huge influence on film noir and those crisp shadows and lines are very visible and starkly beautiful here. As with M, the movie has a certain quiet sympathy for its villain, even when he speaks calmly over tea about how he met and murdered a particular girl. It’s much simpler to call him evil and be done with it, but that’s only part of the story. I’ll give it four and a half out of five. It seems strange to rave about the editing, but the blending of Fritz Lang with parts of its predecessor was fascinating and wonderfully handled, an excellent lure to draw the viewer in. 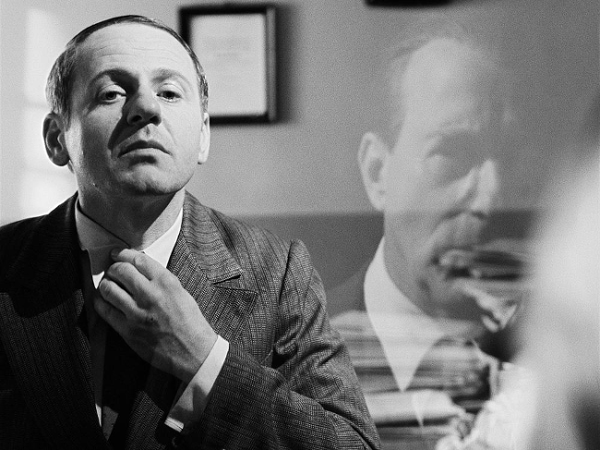 It can’t have been easy to compete with Peter Lorre’s memorable cinematic psychopath, but Finzi easily rises to the challenge, creating a terrifyingly normal murderer — sometimes seeming a good deal more normal than the obsessive, tortured artist Lang. More proof, if any was needed, that there can be a very fine line between genius and insanity.